Here it is another stock-based (modded) custom ROM for Samsung Galaxy V SM-G313HZ, Nemoid. 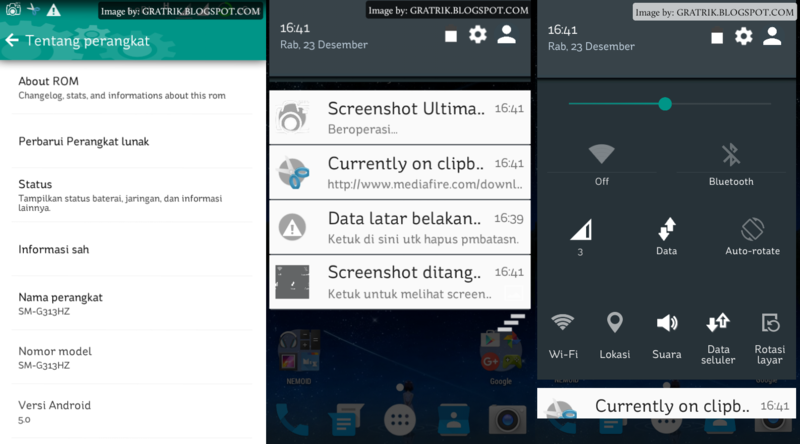 Nemoid is a theme-inspired ROM from Android Lollipop style. I don't know much about the author, so if you want to know more about the author / developer please visit the source link I gave below. According to the ROM info, Nemoid is take from NEed MOre IDea. Don't ask me about the reason of the ROM naming because I am not the developer :v .
Nemoid is one of the oldest custom ROM ever created for Samsung Galaxy V SM-G313HZ Android phone. This ROM is another stock-based modded ROM with addition of so many features and themed to be Android Lollipop look-a-like. Download the Nemoid v1 ROM zip file and save it to your SdCard. Just straight choose "Install zip" -> "choose zip from sdcard", find where you save the Nemoid v1 ROM zip file and choose it to install it. After done, do "wipe cache partition" and "wipe dalvik cache" (advance -> wipe dalvik cache). Reboot your Samsung Galaxy V Android smartphone. "Stopped" System UI (appears unlimited pop up) when trying to change profile photo on notification drawer. So if you want to try this (change profile photo on notification drawer), make sure you know the way to fallback to escape from such that situation. White text on white background on some little part of Settings menu. Comments (0) in "Nemoid v1 Samsung Galaxy V SM-G313HZ Custom ROM"